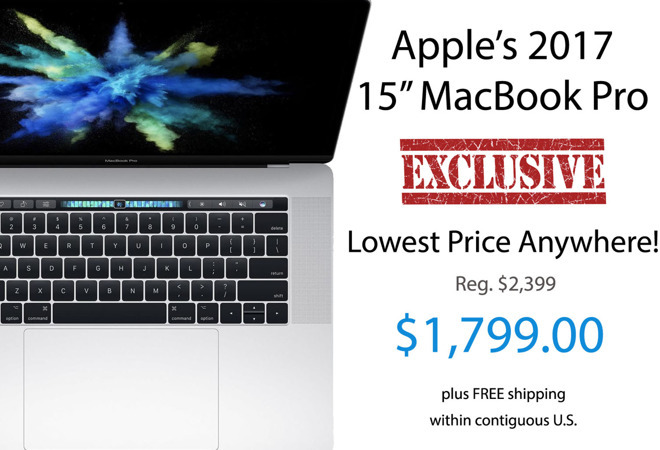 DEALS EXPIRED: Available only at AppleInsider, these MacBook Pro deals offer readers the lowest prices ever on Apple's loaded Mid 2018 15-inch models. Equipped with the line's fastest 2.9GHz Core i9 processor, readers can also select from a variety of RAM, storage and graphics combos, with discounts of up to $900 off MSRP. Want to see how these deals stack up? Check out our 2018 15-inch MacBook Pro Price Guide for up-to-date pricing across many Apple authorized resellers. 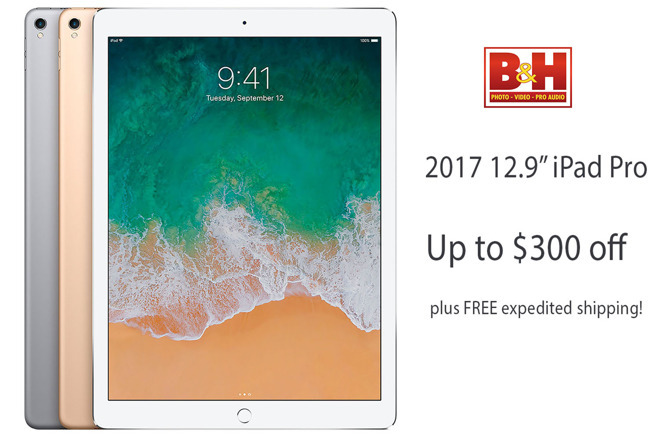 DEALS EXPIRED: Apple authorized reseller B&H is slashing prices on Apple's 2017 12.9-inch iPad Pro with discounts of up to $300 off . These tablets also qualify for free expedited shipping within the contiguous U.S., with no tax collected in many states . These deals, which are limited to stock on hand, may sell out at any time. To see how the markdowns stack up, be sure to visit our 2017 12.9-inch iPad Pro Price Guide . 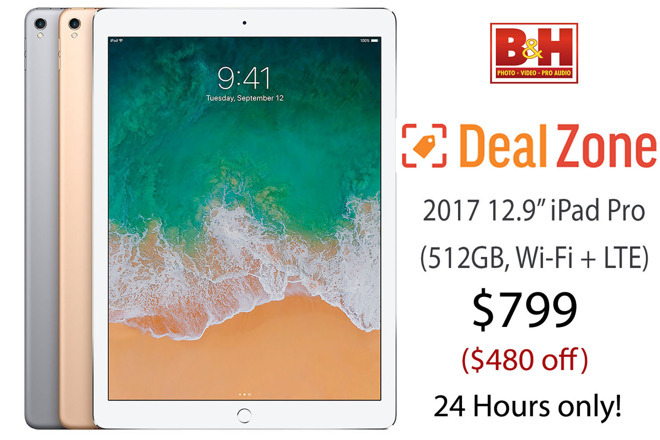 DEAL EXPIRED: Today only, B&H is knocking $480 off 2017 12.9-inch iPad Pros with 512GB of space and Wi-Fi + Cellular connectivity during its 24-hour DealZone event. Shoppers can select between Silver , Space Gray and Gold for $799, delivering the lowest price we've ever seen on these tablets . Grab 'em while you can! DEALS EXPIRED: For a limited time only, B&H Photo is taking $400 to $600 off loaded Mid 2018 15-inch MacBook Pros exclusively for AppleInsider readers. Prices start at $2,799 for 1TB models that also feature an upgraded 2.6GHz processor and Radeon Pro 560X graphics. Need even more storage? Upgrade to the robust 2.6GHz, 32GB, 2TB, Radeon Pro 560X config and save $600 . These deals provide shoppers with the lowest prices available by $350 to $500, according to our 2018 15-inch MacBook Pro Price Guide . 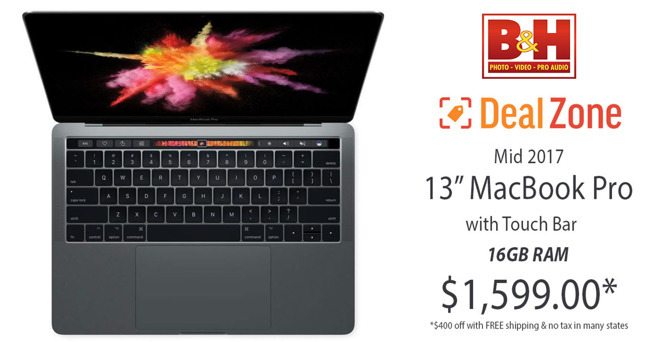 DEAL EXPIRED: B&H Photo this week is taking $900 off a very popular Mid 2017 13-inch MacBook Pro with Touch Bar exclusively for AppleInsider readers. Priced at $1,999 with this special link , the loaded model features an upgraded 3.5GHz processor, 16GB of memory and 1TB of SSD storage. 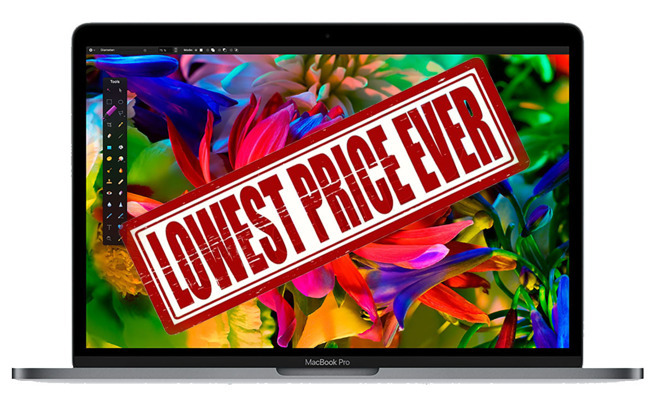 This deal provides shoppers with the lowest price available, according to our 2017 13-inch MacBook Pro with Touch Bar Price Guide , with 2018 systems costing at least $500 more . 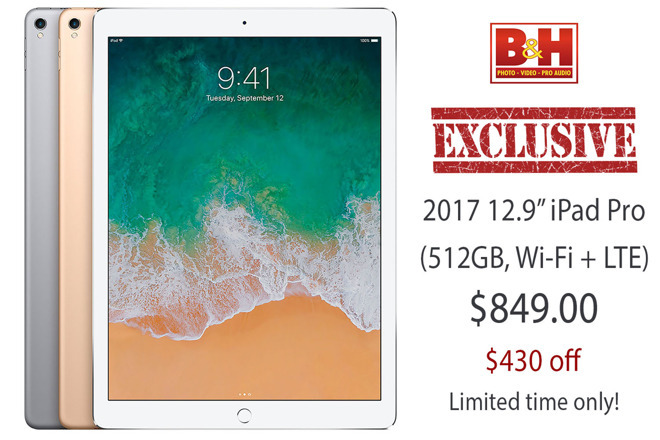 DEALS EXPIRED: Apple's Mid 2017 12.9-inch iPad is marked down exclusively for AI readers this week. These tablets have ample storage at 512GB with Wi-Fi + Cellular functionality to keep you connected on the go. Retailing for $1,279, these top-of-the-line iPad Pros are now marked down to $849 with free expedited shipping within the contiguous U.S. Plus, B&H is throwing in a free screen protector valued at $19.95. 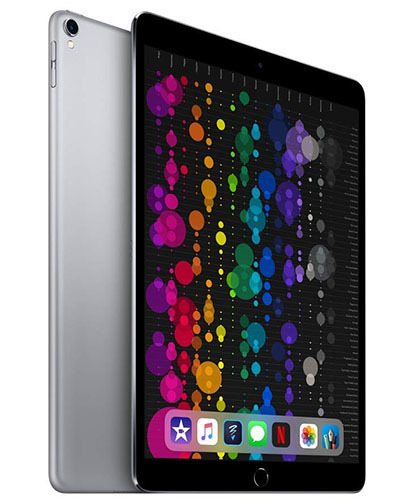 According to our 2017 12.9-inch iPad Pro Price Guide , this is the lowest price available from an Apple authorized reseller without even factoring in the free gift. SOLD OUT: While supplies last, Amazon has Apple's 10.5-inch iPad Pro (64GB, Wi-Fi) on sale for $499.99 , a discount of $150 off. This model in Silver or Space Gray offers support for Apple's first generation Apple Pencil and features a 10.5-inch Retina display with ProMotion and True Tone technology. According to our iPad Pro Price Guide , Amazon's price is the lowest available by at least $110, and the offer may sell out at any time. 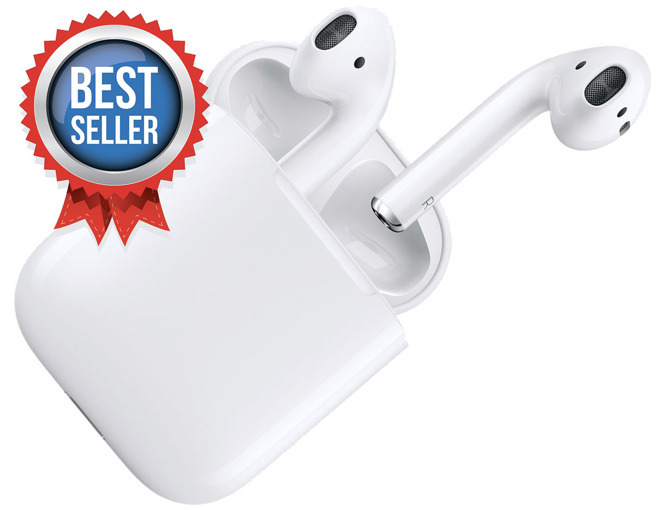 SOLD OUT: Apple authorized reseller B&H Photo has Apple AirPods back in stock for $159. The wireless earphones have been in hot demand since the start of the holiday shopping season, and quantities may still be limited. What's more, B&H is also tacking on free expedited shipping on orders shipped within the contiguous U.S. for fast delivery to your doorstep. While Apple and Apple authorized resellers are both reporting two to four week shipping delays for the Nike+ Apple Watch Series 4, Nike itself has GPS + Cellular models in stock with free standard shipping for delivery in two to four business days. Need it even sooner? Nike also has next day shipping available for $25. This puts orders placed before 5 p.m. Eastern available for delivery the next day when the fastest shipping method is selected. DEALS EXPIRED: Apple authorized reseller B&H Photo is knocking $100 to $200 off nearly every Late 2018 13-inch MacBook Air this week, bringing prices down to as low as $999 . B&H is also tacking on free expedited shipping on orders shipped within the contiguous U.S., and the retailer will not collect sales tax on orders shipped outside of AL, CT, HI, IL, IN, KY, ME, MD, MI, MN, MS, NV, NJ, NY, NC, ND, OK, SC, SD, VT, WA and WI* . According to our 2018 MacBook Air Price Guide , these deals ring in as the lowest prices available. 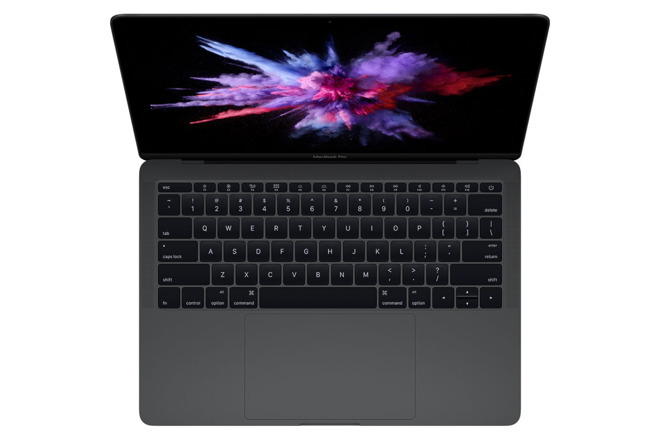 DEAL EXPIRED: For one day only, Apple authorized reseller B&H Photo is knocking $400 off Apple's upgraded Mid 2017 13-inch MacBook Pro with Touch Bar. Now $1,599 for the 3.1GHz, 16GB, 256GB config in Space Gray, this deal also includes free expedited shipping for fast delivery. What's more, B&H will not collect sales tax on orders shipped outside AL, HI, IL, IN, KY, MD, ME, MI, MN, MS, NC, NJ, NY, ND, OK, VT, WA and WI — potentially saving many shoppers another $125 on average. Offer ends at 11:59 p.m. Eastern on Dec. 4 or while supplies last. 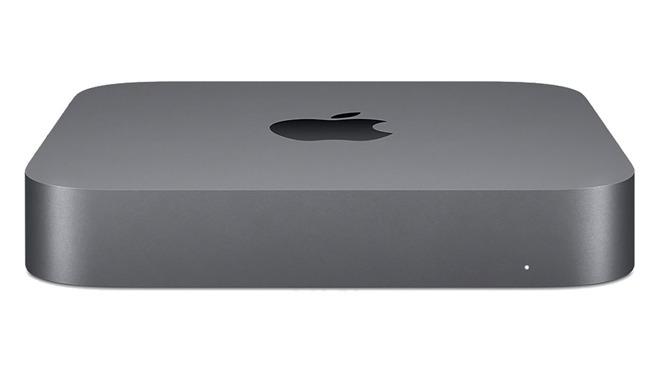 DEALS EXPIRED: Year-end deals are in effect now on Apple's brand-new 2018 Mac mini. These compact systems in Space Gray are currently $70 to $150 off with free expedited shipping within the contiguous U.S. According to our Mac mini Price Guide , these deals offer shoppers the lowest prices available from an Apple authorized reseller. DEAL EXPIRED: For a limited time only, Apple authorized reseller Adorama is taking $100 off two 2018 Mac mini systems for the Black Friday and Cyber Monday weekend. These deals, which can be activated with coupon code APINSIDER using the pricing links below and in our Price Guide , deliver the lowest prices anywhere on the newly released configurations. DEALS EXPIRED: Adorama has issued deep markdowns on Mid 2017 15-inch MacBook Pros exclusively for AppleInsider readers. Priced to move quickly, the configurations shown below are not only eligible for cash rebates, but coupon code APINSIDER is knocking an additional $25 to $100 off the premium models. This brings prices down to as low as $2,149.00 for systems with upgrades. Plus, Adorama will not collect sales tax on orders shipped outside NY and NJ, potentially saving many shoppers another $165 to $335. DEALS EXPIRED: B&H is offering shoppers the lowest prices on an assortment of Mid 2017 15-inch MacBook Pros this week, with savings of up to $1,200 off . In addition to being the most aggressive deals available , B&H is throwing in free expedited shipping within the contiguous U.S. to get you up and running in a matter of days. These deals are valid for a limited time only while supplies last. DEAL EXPIRED: Today only, B&H Photo is discounting both 11-inch iPad Pros and 12.9-inch iPad Pros . These 2018 models are brand-new with support for Apple's updated second generation Pencil and Smart Keyboard Folios . What's more, each iPad Pro qualifies for free expedited shipping within the contiguous U.S. — and B&H will not collect sales tax on orders shipped outside AL, HI, IL, IN, KY, MD, ME, MI, MN, MS, NC, NJ, NY, ND, OK, VT, WA and WI. For many shoppers outside of those states, this can equate to $100 to $160 in savings compared to shopping at Apple. Top discounts can be found below, while a full list of deals is available 24/7 in our iPad Price Guide . DEAL EXPIRED: Apple authorized reseller B&H Photo is offering shoppers the lowest price on Apple's HomePod . 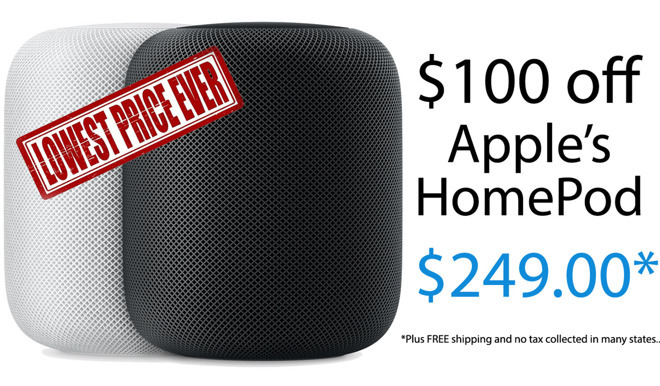 Now $249 after a $100 instant rebate , B&H also will not collect sales tax on HomePod orders shipped outside AL, HI, IL, IN, KY, MD, ME, MI, MN, MS, NJ, NY, ND, OK, VT, WA and WI. Shipping is free within the contiguous U.S. as well, putting this in your hands the quickest and for the lowest price. 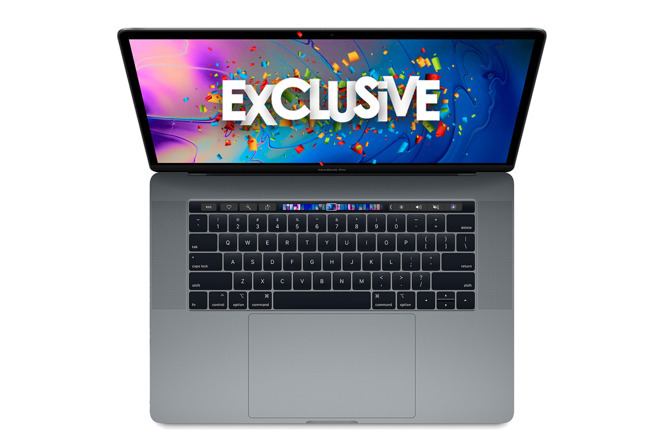 SOLD OUT: Apple authorized reseller B&H Photo is slashing the price of the 2017 13-inch MacBook Pro with Touch Bar by $400 this week, bringing the price of the Silver and Space Gray models down to $1,399.00 . 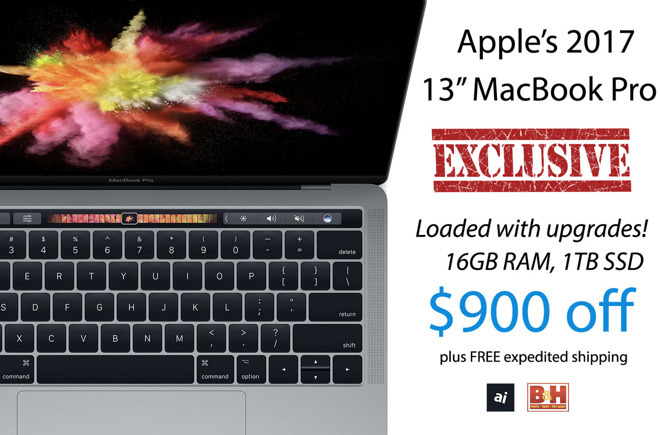 This special offer rings in as the lowest price available for the 3.1GHz, 8GB, 256GB model by at least $100, according to our 2017 13-inch MacBook Pro with Touch Bar Price Guide . In addition to the cash savings, these systems qualify for free expedited shipping within the contiguous U.S.
DEAL EXPIRED: Today only, B&H is slashing the price of two high-end Mid 2017 15-inch MacBook Pros by $800 to $1,400 during its DealZone event. The first config is equipped with a 3.1GHz Intel Core i7 processor, 512GB of SSD storage and top-of-the-line Radeon 560 graphics. The second model is Apple's top-of-the-line config with 2TB of storage, a 3.1GHz processor and Radeon 560 graphics. Now on sale for $2,799.00 after a $1,400 instant rebate, this price is the lowest available by at least $475 . DEAL EXPIRED: Apple authorized reseller B&H Photo is delivering triple digit holiday savings on Apple's HomePod . Now $249 after a $100 instant rebate , this deal offers shoppers the lowest price available on the smart speaker. In addition to the cash rebate, you can also take advantage of additional perks, such as no tax collected on orders shipped outside AL, HI, IL, IN, KY, MD, ME, MI, MN, MS, NC, NJ, NY, ND, OK, VT, WA and WI. Expedited shipping is also free within the contiguous U.S., putting this in your hands the quickest and for the lowest price. Supplies are limited at the reduced price. DEAL EXPIRED: Readers this week can save up to 44% on the Onyxx pocket-sized Qi wireless charging pad that's water and dust resistant. Currently in the funding stage on Indiegogo, those who pledge $49 plus shipping can receive one Onyxx charger with estimated delivery in December 2018. Only 100 single-pack units are available at the special price, with each Onyxx portable power bank supporting the iPhone 8, 8 Plus, X, XS, XS Max and XR. Need more than one? Three and six-pack bundles are also discounted exclusively for AI readers. DEAL EXPIRED: For three days only, Apple authorized reseller B&H Photo is knocking $600 off Apple's Mid 2017 15-inch MacBook Pro in Silver exclusively for AppleInsider readers. 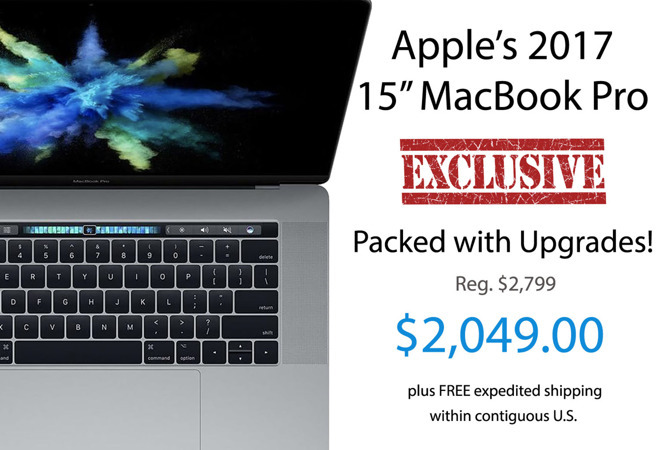 Now $1,799.00 using the step-by-step instructions below, this price is the absolute lowest available for the standard config, according to our 2017 15-inch MacBook Pro Price Guide . 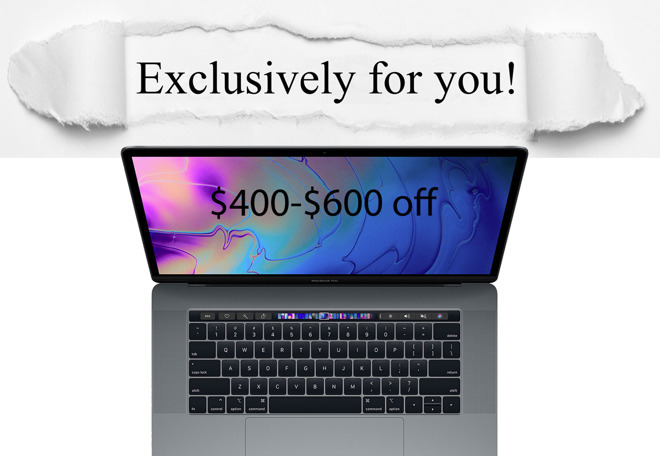 Plus, expedited delivery is free within the contiguous U.S.
DEALS EXPIRED: Looking for the lowest entry price into a Mid 2017 13-inch MacBook Pro ? Adorama is offering AI readers exclusive savings to the tune of $25 to $50 off nearly every Mid 2017 13-inch MacBook Pro with coupon code APINSIDER This is on top of already reduced pricing for qualifying configurations. What's more, Adorama will not collect sales tax on orders shipped outside NY and NJ, making these deals $200 to $335 cheaper on average for many shoppers compared to paying full price with tax at the Apple Store. Plus, take advantage of no interest if paid in full within 12 months using the Adorama Credit Card. To redeem these offers, see the step-by-step instructions below. And to view the latest prices and availability, check out our new 2017 13-inch MacBook Pro Price Guide. DEALS EXPIRED: Readers this week can exclusively save $25 to $100 on many Mid 2017 13-inch MacBook Pro with Touch Bar models at Adorama with coupon code APINSIDER and the pricing links in this post. This bonus discount is on top of Adorama's already reduced pricing, making for total savings of up to $400 off MSRP on many models. The Apple authorized reseller is also throwing in free shipping on the recently announced systems, plus sales tax will not be collected on orders shipped outside NY and NJ. For many customers outside those two states, this averages out to $195 to $560 in savings compared to paying full retail price with tax. See how these deals stack up in our 13-inch MacBook Pro with Touch Bar Price Guide. DEAL EXPIRED: B&H Photo also has Apple's Mid 2017 15-inch MacBook Pro with upgrades (2.9GHz, 16GB, 512GB, Radeon 560)marked down to $2,049.00 , a discount of $750 off MSRP exclusively for AI readers. 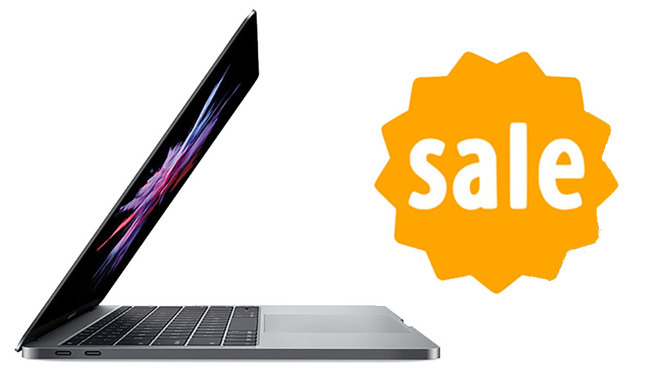 This discount represents the lowest price available by at least $100, according to our 2017 15-inch MacBook Pro with Touch Bar Price Guide . B&H is also throwing in free expedited shipping within the contiguous U.S. for fast delivery to your doorstep. Apple authorized reseller Adorama is exclusively offering AppleInsider readers an additional $50 to $80 off most Mid 2017 27-inch iMac 5K configurations with promo code APINSIDER on top of already reduced pricing. With combined coupon and instant savings, shoppers can save $70 to $170 off MSRP. What's more, shipping is free on the new iMacs, and Adorama will not collect sales tax on orders shipped outside NY and NJ. For shoppers outside those two states, that can mean $260 to $525 in savings compared to paying full price with tax at the Apple Store. See how these deals stack up against other Apple authorized resellers in our 27-inch iMac 5K Price Guide. Please note, the prices displayed are after any coupon and/or instant discounts. DEAL EXPIRED: Ringing in as the lowest price available from an Apple authorized reseller, according to our Headphones Price Guide , Adorama is offering AI readers an exclusive $7.49 discount on Apple AirPods with coupon code APINSIDER on top of Adorama's instant $15 discount. This brings the price down to $137.50 with free shipping and no tax collected on orders shipped outside New York and New Jersey, making this deal $37 cheaper on average compared to buying from the Apple Store, Verizon, AT&T, etc. 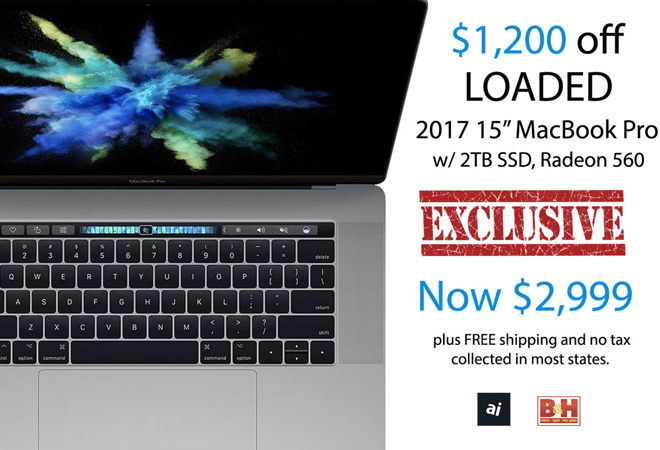 DEAL EXPIRED: Ringing in as the largest discount we've seen to date on Apple's loaded Mid 2017 15-inch MacBook Pro, B&H is knocking $1,200 off the top-of-the-line system in Space Gray. Now $2,999.00 using the step-by-step instructions below, this price is the absolute lowest available, according to our 2017 15-inch MacBook Pro Price Guide . Plus, B&H will not collect sales tax on orders shipped outside NY and NJ* — and expedited shipping is free.